The Sunflower Award is Kansas Grain and Feed Association’s most prestigious award given annually to recognize someone who has made a significant and notable contribution to our industry and/or our association. The contribution may be of scientific achievement, marketing, engineering, transportation or management, but it is not limited to these specifically. U.S. 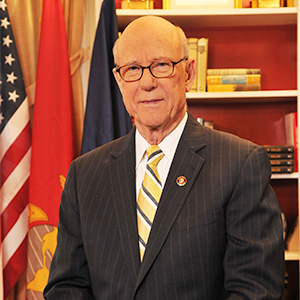 Senator Pat Roberts is a Kansan through and through. He was born in Topeka, graduated from Holton High School and went on to earn his journalism degree from K-State. For 16 years, he represented the Big First District, including his home of Dodge City, in the U.S. House of Representatives. In 1996, he was elected to the U.S. Senate. He is currently serving his fourth term. Roberts has built a reputation as a national leader in agriculture, health care and defense. Senator Roberts is Chairman of the Senate Agriculture Committee. He became the first member of Congress in history to have chaired both the House Agriculture Committee and the Senate committee. Roberts continues his work in the 116th Congress ensuring that farmers and ranchers have the tools they need to advance American agriculture. He is fighting barriers to trade and regulations that threaten producers’ competitiveness. Sen. Roberts is a proud fourth generation Kansan. Born in Topeka on April 20, 1936, Roberts is the son of the late Wes Roberts, chairman of the Republican National Committee under President Dwight Eisenhower. Roberts and his wife, Franki, have three grown children – David, Ashleigh and Anne-Wesley, and seven grandchildren. They own homes in Dodge City and Topeka.